Roses and artisanal chocolate are pretty awesome, but they may not compare to on-the-mat time when it comes to keeping your relationship strong. "One of the best ways to create more intimacy in your relationships is by establishing and maintaining open lines of communication," says Abby Vernon. "In partner yoga, communication is key in order to cultivate a sense of safety and trust, as well as hold space for laughter and play." Vernon is an instructor at St. Louis-based Yoga Six, which opened in 2012 and today operates 13 studios in six cities, from San Diego to Milwaukee. The modern studios have a diverse line-up of classes, from deep stretch to boot camp--and occasional couples workshops and partner activities. For Valentine's Day, Vernon created this simple routine to help couples (and BFFs!) explore and strengthen their relationships. She suggests completing the series twice, holding each pose for three to five full breaths. And in case you're wondering, the male-female photos are there to make the exercises easy to follow. All genders and couplings can benefit. And if you still want to finish up with some post-savasana chocolate, we totally encourage that. Sit face to face with your partner in a cross-legged position with your hands on one another's knees. If this is uncomfortable for your low back, sit on a pillow or bolster for support. Take a moment to truly see the other person. Sometimes we get so busy during our daily lives that we forget to take time to truly look our partners in the eye and appreciate them for who they are. Reach for one another's forearms and interlace, creating a gentle bind (or reinforcing your bond). Find equal resistance between you and your partner as you draw your shoulders back and down. Inhale and lift your heart toward the sky to extend the spine, allowing your head to arc back if it feels appropriate for your neck. As you exhale, draw your chin to your chest and round your upper back, gazing in towards your belly button and spreading your shoulder blades wide. Allow your breath to lead the way as you continue this motion, flowing through spinal flexion and extension together. Begin in a seated position facing your partner, legs crossed (same position as Centering). Cross your arms and reach for each others' hands. Initiate a twist from the base of your spine, twisting in opposition of your partner and using his or her hands to deepen the twist. Check in with your partner, make sure they are breathing steadily and feel comfortable. You may feel a slight chest and shoulder opener during this one, so be sure to communicate. Release on an exhale and slowly repeat on the other side. Sit back to back with your partner in a cross legged position (again using support if desired). Take a few deep breaths in silence and focus on feeling your partner's breath. Notice how when you're close, your breaths tend to sync up and match one another. If you feel open to it, take turns speaking about what's on your mind. Give each person at least three minutes to share without interruption, acknowledgement or feedback. This is a powerful exercise in listening and noticing how the conversation changes when you cannot engage or see your partner's face. Be open to whatever they have to say and merely give them a "thank you" when their time is up. Begin seated, back to back. Have one partner extend his legs and lean forward into a fold (for tight hamstrings bend the knees slightly, or place a rolled up towel under the knees for support). The other partner places both feet on the floor and slowly presses backward, potentially into a gentle backbend. 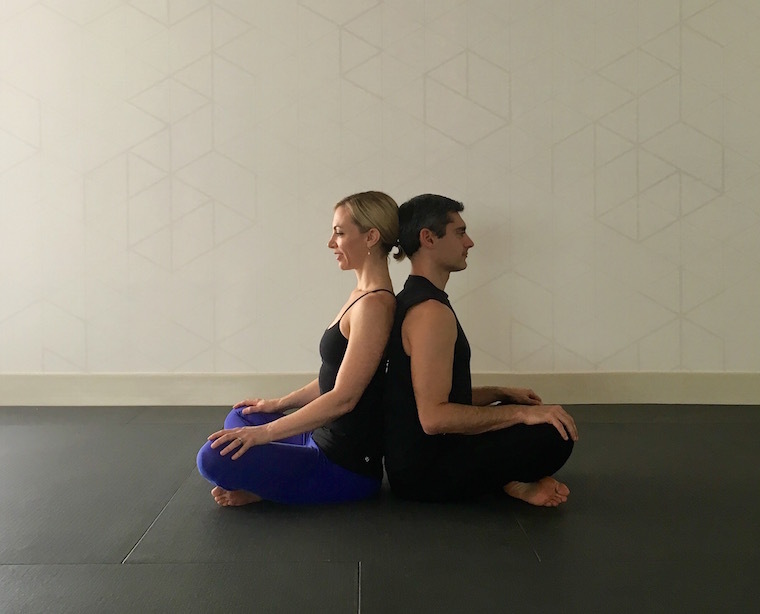 This couples formation stretches her spine and chest (backbend) while releasing his back and opening the hamstrings (forward fold). Be sure to check in with your partner on this one as sensitive lower backs and tight hamstrings are very common. Stand back to back, extend your arms out wide into a T position. Interlace hands with one another, pressing the palms together. 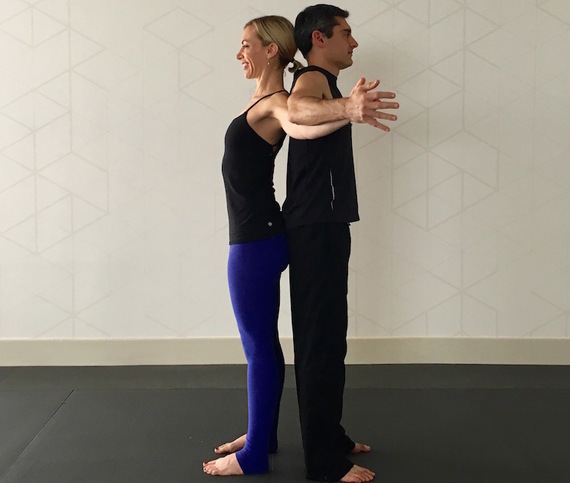 Keep your arms engaged as one partner gently pulls on the others' palms to create a stretch across the chest and shoulders. Continue reading to see the rest of the poses.